Back in January 2001, former ActionCOACH Australia Master Licensee, Trevor Meyhew, set the world record of 14 new coaches in training. 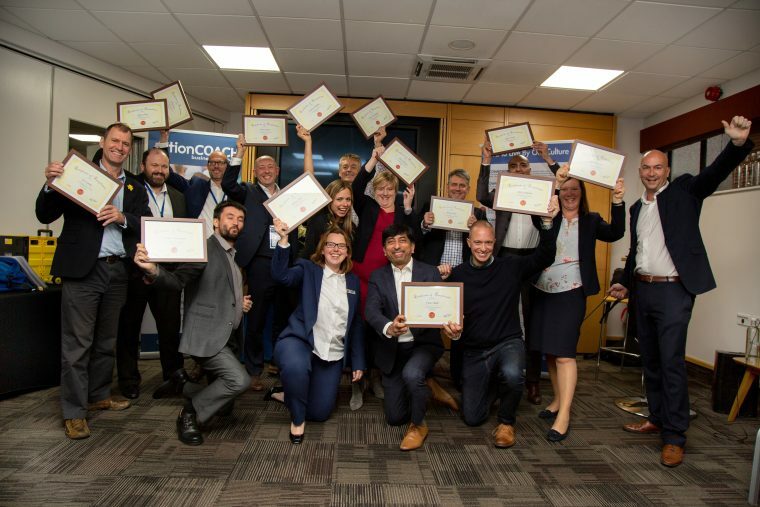 At the end of September, 12 new franchise partners and 2 employee coaches completed their initial training in Nottingham – equalling the world record. Existing franchise partners growing their businesses by hiring and training employee coaches must put their coaches through the ActionCOACH initial training. Franchise partner Parag Prasad has new coach Dan Crompton on his team whilst franchise partner Lucy Cameron has Victor Bahl joining her business in West Sussex. Jenni Morgan and Louise Jones (with her husband Andrew McGunnigle who will attend initial training in January) are the first new franchise partners to join as Senior Partners. A new opportunity to build a coaching firm in an exclusive territory with ActionCOACH, one of the top business consulting franchises. An additional 5 days of training is then given to new franchise partners to break through their comfort zone and learn how to generate leads and turn them into clients during this intensive week of hands on training. The week is designed to immerse you into the world of massive activity, setting daily goals, the benefits of having an accountability partner whilst providing you with a safe environment to practise. This latest group to complete Step-Up Week which included the team from 5 day training, managed to generate an amazing 100 leads to take back to their businesses with a proven process to help turn them into paying clients. Next up it’s a launch seminar, a recent innovation developed by South Africa Master Licensee, Harry Welby-Cooke, whose results have compelled the UK support team to follow suit. The event is arranged by the support team and the presenter introduces local business owners to their new Action Coach and the biggest business secret there is. The worst result is 1 client and the record is 7. (You only need a handful of clients per coach to have a profitable business… fingers crossed, the UK can create a new ActionCOACH world record!